Galapagos and Machu Picchu are two of the most popular destinations in South America. Your tour begins in Quito, which has a well-preserved colonial center and spectacular views of the Andes and nearby volcanoes. You will then travel to the Galapagos Islands for a five day cruise aboard the Galapagos Legend, where you will enjoy plant and animal species that are found nowhere else on Earth. The final part of your tour will take you to Peru to see Machu Picchu, the spectacular mountain top citadel known as the ‘Lost city of the Incas’. Lodging and Meals: This tour includes accommodations for 12 nights (2 nights in Quito, 4 nights on the Galapagos Legend, 2 nights in Lima, 3 nights in Cusco, and 1 night in Machu Picchu), and 22 meals (12 breakfasts, 6 lunches, and 4 dinners). Places Visited: Quito, the Galapagos Islands, Baltra Island, Española Island, Floreana Island, San Cristóbal Island, Santa Cruz IslandLima, Cusco, the Sacred Valley, and Machu Picchu. Depart to Quito. After passing through immigration and customs, proceed to the reception area, where our representative will be holding a sign with your name on it. You will be greeted and then transferred to your hotel. Day 3 (Thu): Quito-San Cristobal Airport-Interpretation Center-Tijeretas Hill (San Cristobal). Morning transfer to the airport in Quito for the flight to Galapagos. Passengers are picked up at the San Cristobal Airport by our guides and taken on a ten minute bus ride to the pier to board the M/V Galapagos Legend. Day 4 (Fri): Gardner Bay-Gardner & Osborn Islets-Suarez Point (Espanola). Gardner Bay, Gardner & Osborn islets. Wet landing on a beautiful white coral sandy beach guarded by a colony of sea lions. There are no trails, so you stay along the shore where you can spot Galapagos hawks, American Oystercatchers, Galapagos Ground Doves, Hood mockingbirds, Yellow Warblers, lava lizards, marine iguanas, and three species of Darwin’s finches: a subspecies of the Large Cactus Finch, which is similar to the large ground finch, the Small Ground Finch (Geospiza fuliginosa) and the Warbler Finch (Certhidea Olivacea), another endemic subspecies. Swimming and snorkeling offer the opportunity to see a great variety of the Galapagos’ marine wildlife: king angelfish, Creole fish, damsel fish, parrotfish, manta rays, and white-tipped reef sharks. (Duration: one hour walk/one hour snorkeling). Suarez Point (dry landing). An island of geological interest, you will explore volcanic formations and a riveting wildlife: large sea lion colonies and seabirds including the Española mockingbird, Nazca Boobies, and the spectacular Red-billed Tropicbird. 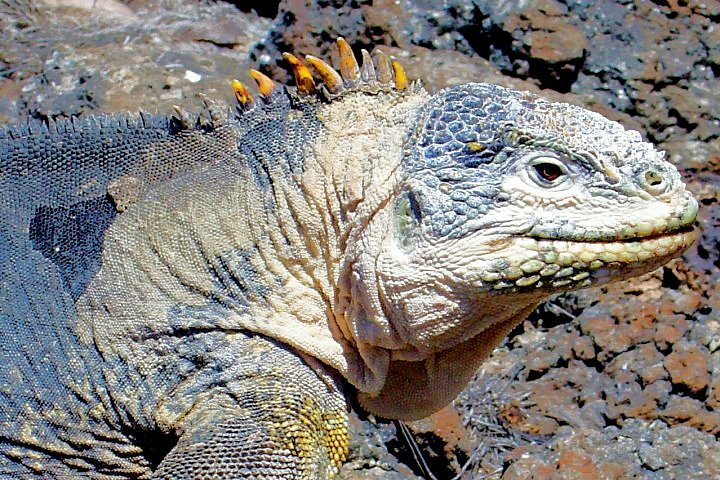 You will also encounter marine iguanas, lava lizards, and the colorful Sally Lightfoot Crabs. Day 5 (Sat): Post Office Bay-Cormorant Point-Devil’s Crown-Champion (Floreana). Post Office Bay (wet landing). Located on the north side of Floreana, the bay was named because in 1793 Captain James Colnett installed a wooden barrel which served as an informal post office for sailors passing through, who would take letters with them back to their destinations. Today, visitors continue the tradition by placing unstamped postcards inside the barrel, hoping that some other traveler, going to the letter’s destination, will take it back for free. The chances are that the letter posted can take a long time to arrive at its destination. However, there have been cases where it has arrived before the sender. You may also encounter Darwin’s finches, Yellow Warbler and Lava Lizards. There are great snorkeling opportunities with Green Pacific Sea Turtles. As well, the island is best known for its endemic vegetation: Scalesia villosa, Lecocarpus Pinnatifidus, and the Galapagos Milkwort. Snorkelers can practice on the main beach among playful sea lions. (Duration: 30 minute walk/one hour snorkeling). Cormorant Point, Devil’s Crown, and Champion. Wet landing on an olivine green, sanded beach. You will hike from the black mangrove beds to a brackish lagoon, which usually holds one of the largest flamingo populations in the Galapagos. This island features some endemic plants such as Scalesia villosa, white and black mangrove, and holy stick. The trail continues to a beautiful white sandy beach, one of the most important nesting sites of Green Pacific Sea Turtles. It is important to avoid walking in the water due to the Sting Rays that may be hiding in the sand, which can be dangerous if accidentally stepped on. From the beach, one can spot sea turtles, blue-footed boobies plunging into the water, and small reef sharks floating along the shoreline in the search for food. Day 6 (Sun): Charles Darwin Research Station-Fausto Llerena Breeding Center-Highlands Tortoise Reserve (Santa Cruz). Day 7 (Mon): Carrion Point (Santa Cruz)-Baltra Airport-Guayaquil-Lima. Carrion Point. This rocky cliff offers a great opportunity to further explore the marine biodiversity of the islands. You can snorkel among a variety of colorful fish, stingrays, and if lucky, the magnificent White tipped shark. (Duration: 2 hours snorkeling). Day 8 (Tue): Lima-City Tour. Day 9 (Wed): Lima-Cusco-City Tour. Day 10 (Thu): Cusco-Sacred Valley-Awanakancha-Pisac Market-Ollantaytambo. Day 11 (Fri): Cusco-Machu Picchu. Day 12 (Sat): Machu Picchu-Cusco. 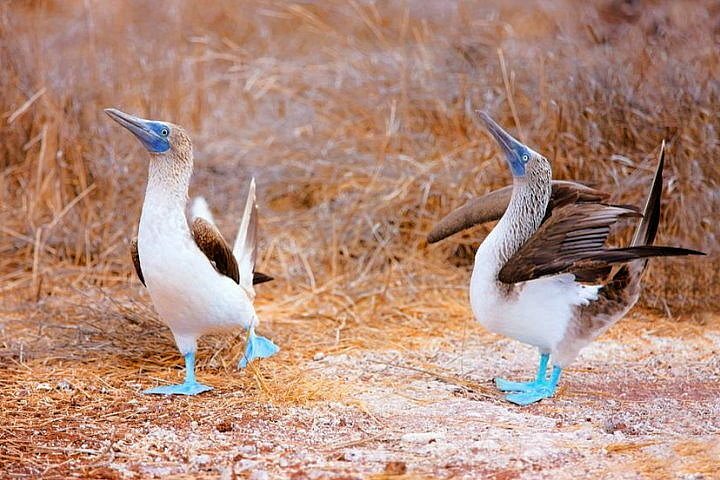 Group Private: All services included in Quito and Galapagos are operated on a group basis. In Peru, all transfers are private, and the city tours of Lima and Cusco, the Sacred Valley of the Incas excursion, and Machu Picchu guided tour are group tours for single passengers and 3 Star accommodations, and private for 4 Star, 5 Star, and Deluxe accommodations. To Book This Trip: We require a non-refundable deposit of $1,000 per person plus the cost of the airfare (if we make the arrangements for you). The balance of the trip cost is due 60 days prior to departure.